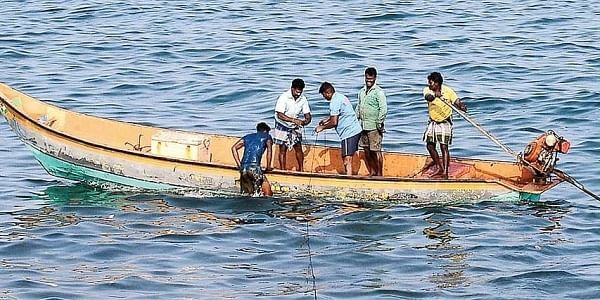 On July 29, the island nation had announced the release of 77 Tamil Nadu fishermen, who were arrested on charges of crossing the International Maritime Boundary Line. RAMESWARAM: Six of the 42 boats belonging to fishermen from Tamil Nadu, which were seized and subsequently released by the Sri Lankan navy, were brought back here today. On July 29, the island nation had announced the release of 77 Tamil Nadu fishermen, who were arrested on charges of crossing the International Maritime Boundary Line (IMBL), and the 42 boats seized from them. Subsequently, the fishermen, who belonged to Pudukottai, Ramanathapuram, Nagapattinam and Karaikal districts, had arrived at Nagapattinam on August 4. On August 17, a seven-member delegation from Tamil Nadu, led by the Additional Director of the Fisheries Department, G S Sameeran, and also comprising Deputy Director (Fisheries) P Isaac Jayakumar, Rameswaram Fishermen Association president P Sesuraja and members of the fishermen associations of Pudukottai and Nagapattinam, had left for Sri Lanka to inspect the condition of the boats. Subsequently, a team comprising 53 fishermen, technicians and fisheries department officials went to the island nation on September 27 to complete the formalities and bring back the boats, Jayakumar said. The fishermen towed seven boats with their vessels to bring them back to Rameswaram. However, the seawater gushed into one of the boats, forcing them to abandon it near the Kareinagar coast in Sri Lanka, Sesuraja said. The remaining six boats were brought to the Rameswaram fishing jetty this evening, he added. The other boats would also be brought back over the next few days, Sesuraja said.